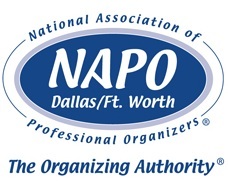 An annual meeting exclusively for NAPO-DFW Members where we share our questions, answers, business knowledge, lessons learned, and successes with one another! How is this different than the “Organizing for A Living” panel meeting? This is a closed meeting for Organizers instead of Organizers AND those “interested” in becoming an organizer and/or the industry. Your questions can be answered by anyone in the meeting versus a “panel” of 3 organizers. To get your questions in the queue, submit them to: profdevelopment@napodfw.com. Questions can be about specific organizing situations or about being in business for yourself or perhaps about products that you want to know more about. Submit your questions early so we can include them!